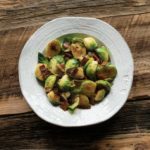 Baconish Cookbook Review + Brussels Sprouts with "Bacon"
This recipe for Brussels sprouts with shallots and tofu bacon is coming to you from the newly-released vegan cookbook, Baconish, by Leinana Two Moons. I’ll give my thoughts and experiences with the book and share the recipe excerpt at the bottom. Photograph used with permission from Vegan Heritage Press. Vegan ‘bacon’ is not a new concept to me. Author Leinana’s original coconut bacon recipe on her blog, Vegan Good Things, is already a staple in my house (so needless to say I was very excited to review this book!). And of course, just a few weeks ago I shared my recipe for rice paper bacon with you. (And in 2018, I now have my own tofu bacon recipe too!) But honestly, I had not given a lot of thought to integrating vegan bacon more smartly into recipes, beyond just putting it on a sandwich or simply snacking on it. Gratefully, this is where I think the book really shines. 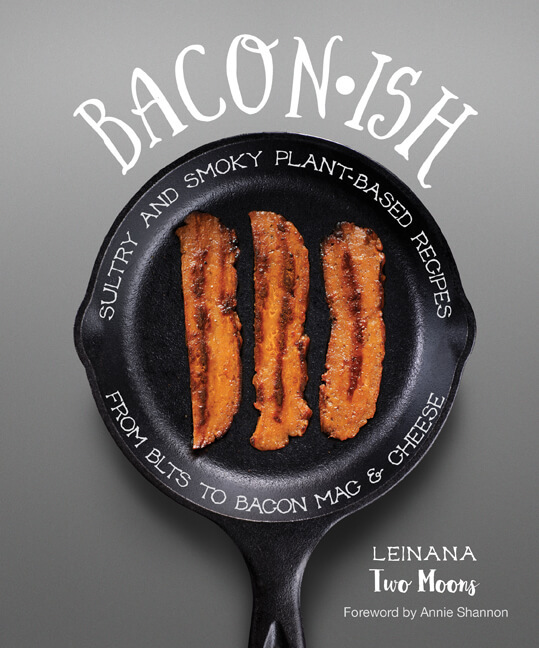 Full of beautiful full-color photographs, Baconish was released on April 19th through Vegan Heritage Press. I know some people take issue with calling something bacon when it’s made out of plants, and frankly, that’s just not an argument that I’m willing to participate in. One can feel free to retitle things “plant-based ____ inspired by certain characteristics of bacon” if that’s important. I’ll stick with the concise, descriptive names :). When I make a vegan bacon recipe I’m looking for something crispy, salty, umami-infused, a little bit smoky, and generally adding a condensed pop of savory flavor to my food. And the recipes in this cookbook absolutely deliver on that. I like the way Baconish is structured. At the beginning of the book there is a brief pantry/ingredients discussion. I have an ever-growing collection of vegan cookbooks and I honestly skim over these sections most of the time. I do, however, like that Leinana included a discussion of the various brands of plant-based bacon available and their pros and cons. Since all of the recipes in the latter part of the book use bacon as an ingredient within them, it’s nice that some guidance is offered for making a semi-homemade shortcut. I will tell you, however, that I have tried a few store-bought ‘bacon’ brands and none of them are as tasty as the homemade recipes in this book, so I recommend making them yourself if you have the time! The second part of the book is just what I was mentioning before: a section of bacon recipes. You’ll find the classic coconut bacon; tofu bacon (used in the recipe I’m sharing); tempeh bacon; vegan bacon bits (TVP-based); and a few super creative and new-to-me types of vegan bacon made from veggies, including eggplant bacon. 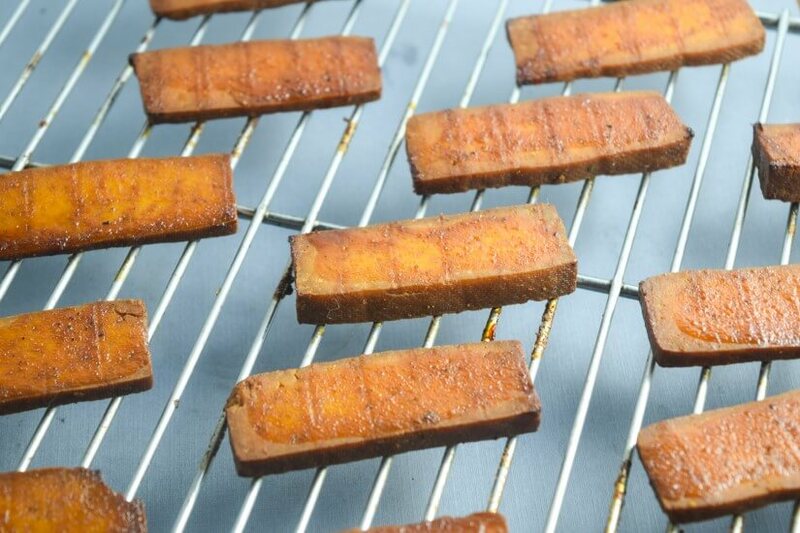 I decided to try the tofu bacon first, which calls for smoked tofu. The smoked tofu I bought at Whole Foods did not have a very smoky flavor on its own, although it did have a super firm, chewy texture, which helped make the bacon crispy once sliced thinly and baked. I definitely plan to make this tofu bacon again and again. It’s super easy and also quite healthy if you use the baked method, which doesn’t require adding any oil (tofu already naturally contains healthy fats!). I also whipped up a batch of my beloved coconut bacon. 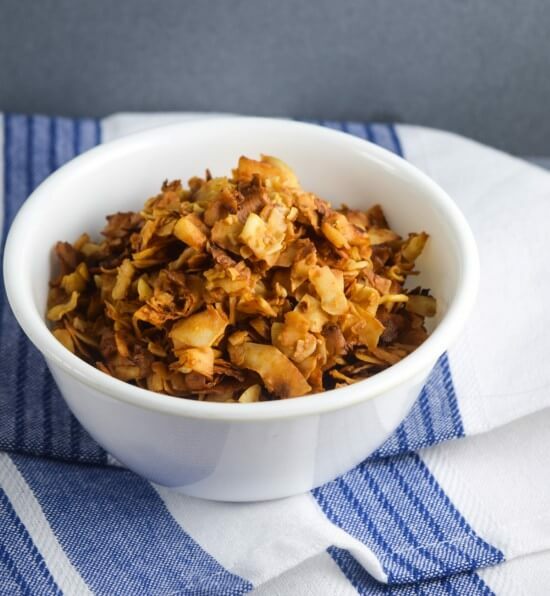 Unlike the tofu bacon, which is crispy on the edges but a bit chewy in the middle, coconut bacon is ubercrispy, obviously in smaller bits, and has a slight coconut flavor. If you haven’t tried coconut bacon before, I highly highly recommend whipping up a batch. It’s just about the easiest thing in the world to make! The third part of the book consists of recipes for using your newly-made veggie bacon, divided into a few chapters based on course. So here’s the thing about vegan bacon – it’s super tasty, but when propagated into a new recipe, it doesn’t function exactly the way that pork-based bacon would. That is to say, it doesn’t release flavorful oils into the rest of the dish. And as a result, the way that its texture changes as it’s cooked into a dish is different too. So, taking an non-vegan recipe that calls for bacon and adapting it to use a vegan version is more nuanced than simply swapping the new ingredient in; you have to adjust the methodology intelligently depending on how bacon is used in the recipe. All of that is to say that I think Baconish really excels at this. For example, the Brussels sprouts with shallots and tofu bacon really reminds me of a similar dish I would make back during my teenage meat-eating phase. 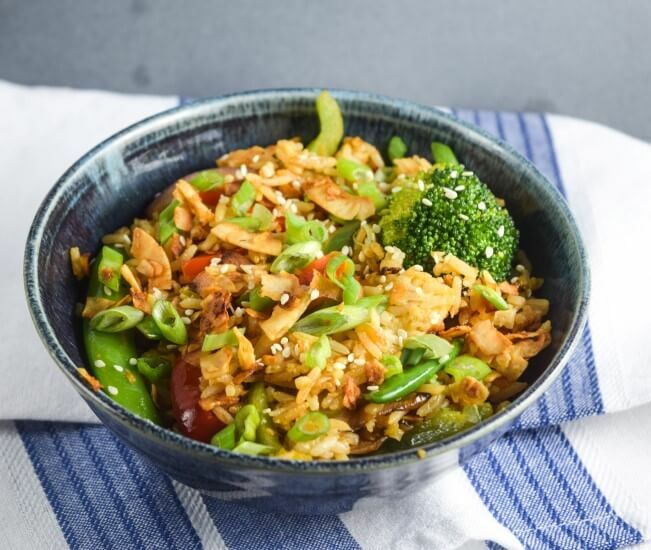 But Leinana smartly changes the way that the tofu bacon is introduced into the dish – by frying it along with the shallots, then setting it aside and folding it in at the end. This ensures that the flavor of the tofu bacon doesn’t get washed out, and that the tofu doesn’t soften up too much by being cooked with the sprouts (which have liquid added to them and then evaporated). Honestly, the initial mixture of caramelized shallots with tofu bacon is so wonderfully flavorful that I couldn’t stop eating it on its own as I waited for the sprouts to cook. I think it would be a great idea to just do that first part of the recipe and use it to top a veggie burger or veggie dog. Mmmmmmm. Also, I substituted coconut sugar for regular brown sugar in the recipe and it worked wonderfully. It is clear that a lot of thought went into the recipes in Baconish, and as a result, the recipes I tried worked as promised and were extremely delectable. I didn’t get around to trying any of the intriguing salty-sweet desserts, but I am seeing lots of rave reviews about the maple bacon doughnuts (and I can totally understand how those would be amazing) and the chocolate bacon truffles. In addition to the Brussels sprout dish, I also tried the bacon fried rice. It called for tofu bacon, too, but I decided to substitute coconut bacon because I already had it on hand and I thought it would pair well with those flavors. And it did! The flavor of this dish was robust and satisfying. I loved how the coconut bacon got a little bit chewy once it was cooked into the sauce. I took some liberty with my selection of vegetables, too, and I used double the amount of scallions because I’ve never heard of too many scallions. The book makes proclamations of being full of “healthy bacon dishes”, and I’m not completely sure if I agree with this. For example, the fried rice called for a total of 5 tablespoons of oil, not including any oil used in the creation of the bacon that went into it. I reduced the oil to a total of 2 tablespoons and even then the dish was fairly rich for me. Similarly, for the Brussels sprouts I reduced the oil by at least half. Many of the recipes call for vegan dairy substitutes as well, especially vegan cheese shreds, which I never use. However, if you’re used to making substitutions for ingredients like that, you should be able to easily adjust the recipe to your needs, or at least use the recipe’s idea as a jumping-off point. Thinking about the purpose that this cookbook will serve on my cookbook shelf, it doesn’t bother me that the recipes aren’t the most healthy or unprocessed. This is a fantastic collection of ideas for adding crispy or chewy punches of umami to your savory dishes, and to make your desserts more complex by combining salty and sweet. This book pushes the boundaries of what flavors and textures can be used in vegan food and I think it is a success, even if not all of the individual recipes suit my tastes. 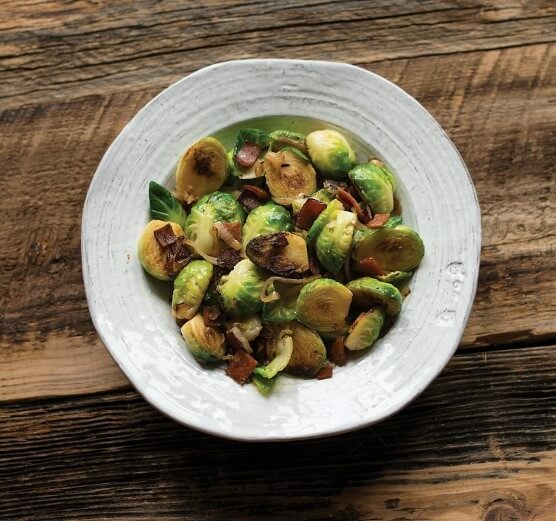 As a reward for making it through my short novella of a review, you get this recipe for Brussels sprouts with shallots and tofu bacon!. I made it a second time for the pictures because I ate it too quickly the first time. And I didn’t have quite enough Brussels sprouts so I made up for it by adding half a head of cauliflower. If I had to choose I’d do the all-sprouts version but with cauliflower it’s great as well! From Shannon: I highly recommend making these with my homemade tofu bacon, linked in the ingredients list! Heat the remaining 2 tablespoons of oil in a large skillet over medium-high heat. Add the Brussels sprouts to the pan in a single layer, cut-side down. Leave undisturbed 2 to 3 minutes before stirring, to help them brown and caramelize. Continue to cook and stir occasionally until the Brussels sprouts turn bright green. Add the white wine to the Brussels sprouts, cover immediately, and steam for 2 minutes. Uncover and cook until all the liquid has evaporated and the Brussels sprouts are tender, about 6 to 8 minutes. Stir in the shallot-bacon mixture and serve hot. (Shannon's note) I substituted coconut sugar for the brown sugar in the recipe. I also reduced the oil quantities to 1 teaspoon + 1 tablespoon. I used 3/4 of the recipe for tofu bacon found in the book for my choice of vegan bacon. The dish didn't need much salt because the tofu bacon was already salty and flavorful, but I added a pinch to the shallots when they were cooking, and another few pinches to the Brussels sprouts after I first stirred them. (Shannon's note) To make a meal, I served these Brussels sprouts with a baked potato and some cauliflower, and cooked down the leftover marinade from the tofu bacon with some vegetable broth and nutritional yeast to make a quick gravy. (Shannon's note) Nutrition facts exclude the vegan bacon since they will vary depending on which type of vegan bacon you use. Disclosure: I received a complimentary copy of this cookbook from Vegan Heritage Press, who are also generously providing the giveaway copy. I like meat-analogues as a once in while treat — and usually if they are made with plant-based ingredients! I am completely fine with meat analogues. I make my own mock chicken seitan, and make a tofu chorizo as well. And I am a fan of Gardein products. No problem, as long as the.y don’t contain chemicals/artificial ingredients. I like anything that helps people to eat more plants and less meat! I have no problem with calling it tempeh bacon, or chickenless tenders, or soy sausage, etc. I love them! Many of them don’t really resemble the animal product that they are named after anyway, so no grossness there. For instance, there are some awesome vegan Bries out there, but they don’t really have the same taste or texture as a dairy-based Brie. Mmmm….I bet they would all be really awesome with the Bacon Jam from Bacon-ish. I think that they are great! I like to add the dimension of savory meat-like flavors. I’m just starting down the vegetarian/vegan trail… I’ll give this a shot! Love them! They make it so easy to eat delicious but cruelty-free sources of protein! I love plant based alternatives a healthy option for those of us that love plant based foods.